Abe is a cloned human prototype with an android brain. And, he's about to be killed. Clonedroid 2112 (Abe) is the latest product of the Multipurpose Android and Cloning Corporation, and a remarkable achievement in artificial intelligence and genetic engineering. However, his creation has embroiled MACC and its new product line in controversy and generated a devastating spin-off effect. Corporate heads order Abe to be dismantled into donor parts for transplant patients, a lucrative act of medical good faith shrouded in duplicity. Dissecting their prototype will save lives and gain public support. It will also clear MACC’s reputation and dispose of a problematic product. But project team leader, Dr. Tamera Everett, is not so eager to dispose of her prototype. When corporate push comes to executive shove, she is the only person willing to speak up for Abe, but doing so places her in jeopardy. Things get worse when a journalist questions the darker side of MACC and her motives as a scientist. Caught in a crisis of conscience, Tamera wants to save Abe, but divided loyalties and employee sabotage stand in her way, and time is running out. Meanwhile, Abe possesses a different vision for the future and greater potential than anyone realizes. With the clock ticking and a storm of uncertainty raging around him, Clonedroid 2112 executes plans of his own. This dystopian science fiction novel is about a cloned human android created for a single purpose—to be an organ donor—even though he is capable of so much more. In a similar vein as works by Asimov and Heinlein, this futuristic story focuses on the pitfalls of playing God and confronts some of the dilemmas challenging our advancing global societies today. 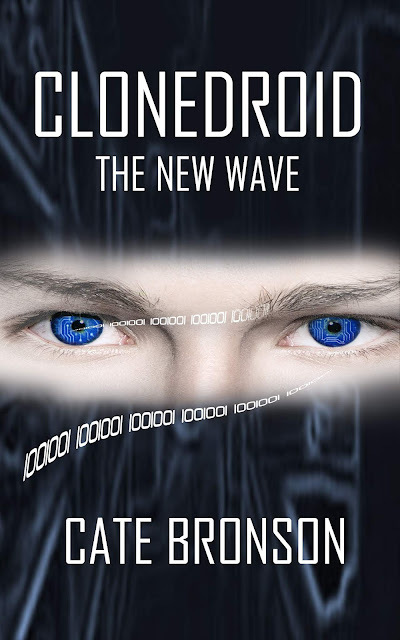 CLONEDROID: THE NEW WAVE will be available as an eBook on Amazon Kindle April 1, 2019.